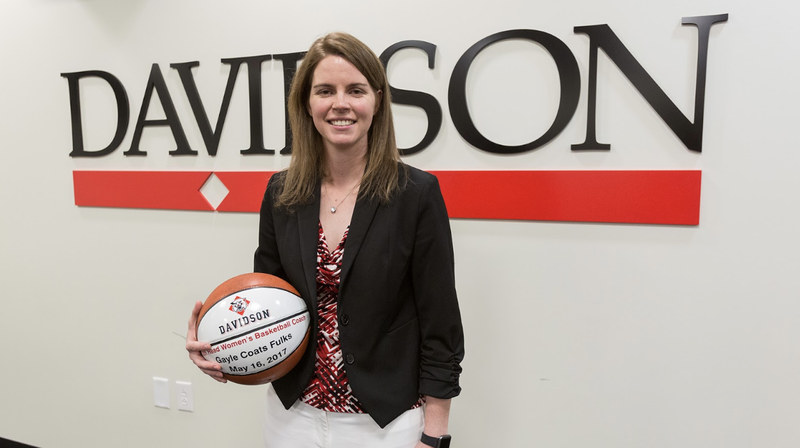 Gayle Coats Fulks was named the 12th head women’s basketball coach for the Wildcats. While Fulks is a young coach, she is a force to be reckoned with. She was recognized in 2015-16 as one of the Women’s Basketball Coaches Association’s Thirty Under 30 Honorees. Coach Fulks took over a program that just finished its third season in the Atlantic 10 Conference after being in the Southern Conference for 21 seasons. LRT Sports was able to ask Coach Fulks about how you can get on her radar, what she looks for in potential recruits, what she looks for in highlight videos and other questions that can help athletes stay motivated to play at the next level. LRT Sports: What is the most important quality you look for in a recruit? Coach Fulks: Most importantly we are looking for high character individuals that are hard working, trustworthy, and a good teammate. Secondly, we only recruit high academic student-athletes. We look for our recruits to take a rigorous high school academic curriculum and achieve almost exclusively As and Bs. Third, we look for basketball athletes who can contribute to our team motto of share, shoot, and stifle. If a recruit can do those three things on the basketball court, along with being a high character individual that achieves well in the classroom we have a fit. LRT Sports: What is the best way for a recruit to get on your radar? Coach Fulks: With the current basketball landscape the way it is, playing well in AAU tournaments during our NCAA sanctioned evaluation periods is the probably the best way to get on our staffs radar. In terms of basketball specific skills, our staff looks for players that have a high basketball IQ, a willingness and motor to compete defensively, good shooters, and smart passers. These qualities, again, fit with our team’s basketball motto of share, shoot, and stifle. Coach Fulks: We don’t really have a specific age or grade when we feel it is best for them to reach out to us (anywhere from rising high school freshmen to rising juniors). A prospective student athlete can reach out to us anytime, but obviously we have a little more time dedicated exclusively to recruiting during the offseason. If it is a recruit that we have been evaluating and contacting we suggest they call us. If it is a prospective athlete that we have yet to evaluate, I suggest sending an email to our staff with an attachment of their academic transcript, highlight film, and full game film and someone on our staff will review it. LRT Sports: What are your expectations for incoming players in the classroom, in the weight room, and on the field, court, etc.? Coach Fulks: Most importantly we expect our incoming student-athletes to work hard in the classroom, weight room, and on the court. We try not to have a cookie cutter approach to expectations because we know each athlete has their own individual strengths and weaknesses. However, we do expect all our incoming athletes to be dedicated to our process and work to improve on the court and in the weight room everyday. LRT Sports: What are the do’s and don’ts when being recruited? LRT Sports: What is the best advice you can offer a recruit? Coach Fulks: Don’t pick a school based on the name or publicity. Find the school that is the best overall fit. Remember that choosing a school is 40-year investment not just a 4-year athletic endeavor. I also suggest making a decision based on the people in the program, instead of the superficial aspects. It is better to pick a school with a coach you trust and future teammates that will support you, then to pick a school based on facilities and cool jerseys (all those superficial things are just a bonus). LRT Sports: What really jumps out at you when reviewing a recruit’s highlight tape? Coach Fulks: I look for a diverse skill set in a limited amount of games. I want to see everything you do. I want to see various ways of scoring, shooting clips, passing clips, hustle plays, and defensive plays. I also look for clips that show high basketball IQ. For one example, I may watch for the cutting/screening action that led to your shot, not just the actual shot. LRT Sports: What are the main do’s and don’ts for a recruit’s highlight tape? LRT Sports: When do you recommend recruits put together and share their highlight reels? Is it best to make their highlight reel during offseason, in the middle of season, or after each game? Coach Fulks: Not after each game, but either mid-season or after the season is fine. LRT Sports: What advice do you have for recruits that get turned down by their dream schools? What are their options if they don’t gain the recruiting attention they desire? Coach Fulks: There are a lot of very good schools out their at a variety of levels. Just because your dream school did not offer doesn’t mean you can’t still fulfill your dreams at an equally great school. So first I would suggest keeping your options open and don’t limit yourself to just one school. Another option is walking on. If it is truly your dream school you may have the opportunity to walk on and still contribute to the team. Coach Fulks: Our staff definitely uses social media, and we use it to find out information regarding potential recruits. There is no denying that social media is a powerful and useful tool for college coaches. Our staff uses it primarily to get information regarding other scholarship offers and basketball related information. However, we do look at the recruit’s pages and we do notice if there is inappropriate content. I once heard someone say don’t post anything you wouldn’t want your grandma to see and I thought that was pretty good advice.